Data-driven business processes are not a nice-to-have but a need-to-have capability today. So, if you’re an executive, manager, or team leader, one of your toughest assignments is managing and organizing your analytics and reporting initiative. Industrialization of analytics is the new buzzword. Overcoming the jumble of point solutions is a non-trivial challenge in a big firm. Disparate vendors, disparate capabilities, different interfaces, all acquired over a long period of time. To meet demand for faster/better/cheaper innovation around analytics, CFOs and CIOs are rethinking their silo’d sourcing strategies, fragmented tech budgets aligned against one-off projects, and are looking at new ways of doing things via out-tasking, IT outsourcing and business process outsourcing their Analytics and Data Science functions. The “should we or shouldn’t we outsource data science” discussion is heating up in board-rooms and executive suites as analytics becomes core to the firm, C-level execs have to consolidate efforts for delivering the same services to different groups within an organization. Outsource Analytics vs. Building a Shared Services Analytics Function at the LoB or corporate level? Outsource the modeling and data science part or hire/build the capabilities in-house? Augment the current staff with domain specific expertise or hire FTEs? Centralize analytics in a shared services model or let the LoBs do their thing? Build vs. Buy vs. Lease (as-a-service cloud solutions) — What is the right configuration… the answer depends on the organization – internal politics, credibility of IT leadership, ability to execute, maturity of business requirements and so on. Why Outsource or Out-task Data Science or Analytics? Data science and analytics capability is becoming table stakes in businesses that haven’t traditionally been thought of as data-focused industries. Who would have thought that maintenance, online dating or renting movies would be an analytically intensive business. However, enterprise IT is often slow to react. In many enterprise IT budgets, the cost of operations (run the business) is the fastest growing line item—consuming 70+% of budget dollars. IT organizations are being asked respond to (grow the business or change the business) by enabling new analytics innovation opportunities, regulatory demands, and building shared private cloud infrastructure that is comparable to Amazon Web Services. A herculean task for IT to keep up. The race to implement innovation is often a driver for outsourcing…acquire the right mindset, toolset, skillset and dataset… to get the job done. LoB leaders, instead of waiting for IT, drive top-line growth by seeking the most direct path to solutions that will support their initiatives. They want solutions that deliver a quick ROI, can be implemented quickly and affordably, without a huge drain on IT (a source they may not have much control over). The result of this approach is a one-off pragmatic, get something-to-market fractured environments. Typical scenario in a large firm… business units leveraging different service providers, different storage and processing technologies, and different front-end visualization tools. In some cases, I have seen organizations with multiple teams contracting with different vendors within the same business units to solve similar problems (e.g., customer retention/attrition, next best offer/action), creating a nightmare for IT who have to support multiple overlapping solutions concurrently in production and customer-facing organizations getting conflicting insights from the different solutions. This scenario typically forces a centralization and subsequent outsourcing discussion. 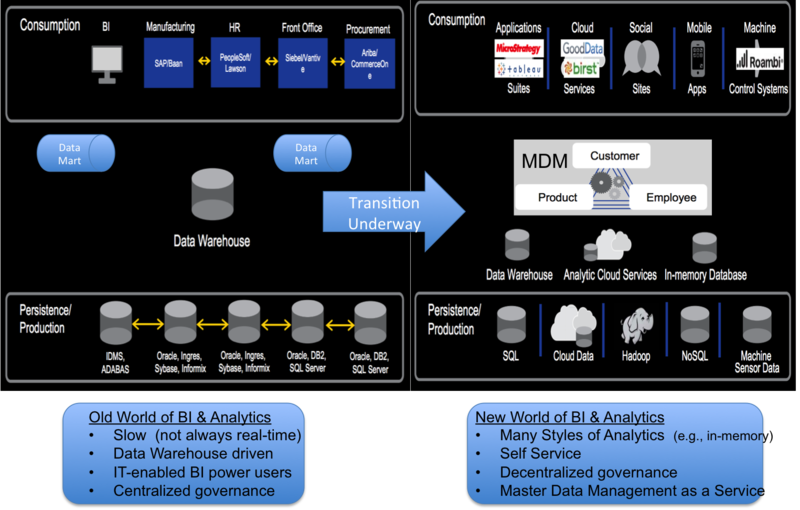 But the nature of centralization (from BI Platform or Datawarehousing) is changing. See figure below. For each area and business need (transformation vs. strategic vs. tactical) there are different vendors that are a better fit. 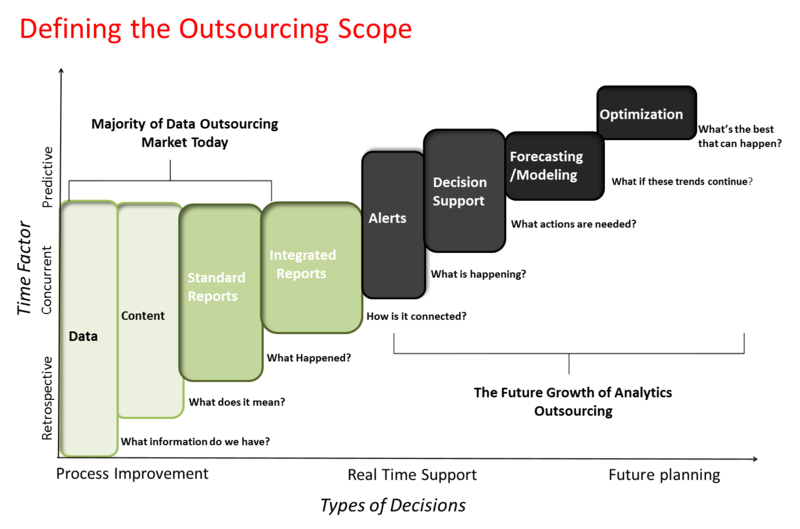 In this posting I examine the frequently asked executive questions around Outtasking or Outsourcing Analytics (and Data Sciences) – models of engagement, cost models etc. Also included is a list of Analytics Outsourcing Providers that I have been tracking. Most of these firms are evolving their capabilities but are rooted in providing BI and Analytics capabilities on a staffing or project basis. Outsourced analytic providers serving many industries, including retail, telecommunications, healthcare and others, provide clients with domain expertise in database-driven marketing and customer segmentation. 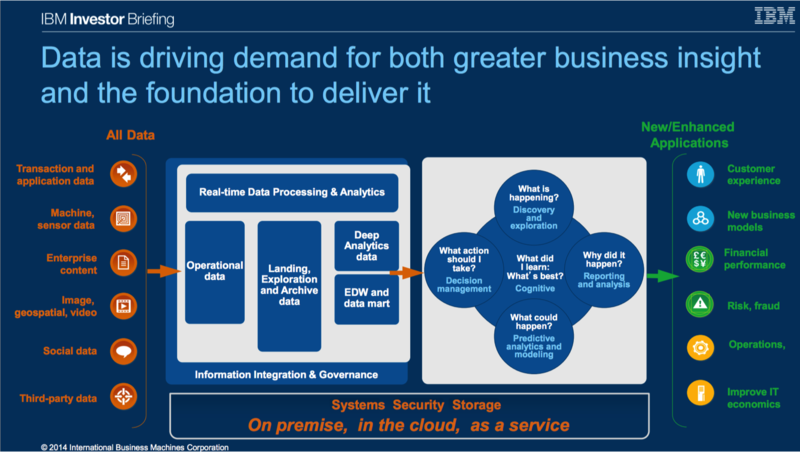 The following figure from GenPact illustrates how a vendor thinks about Analytics Outsourcing. What are the models of Analytics Outsourcing engagement? Regardless of the services—data management, business intelligence and reporting, research, advanced predictive analytics services, and analytics consulting services; you will have to pick a engagement model. SLA or Outcome based is the most complex engagement model. Pay per use “as-a-service” Cloud models – providers are responding to the continuing shortage of data scientists by offering data science know-how as a cloud service. In some cases you will need mixed models. For instance, it’s important to keep in mind that 80% of the costs for data-related projects get spent on data preparation – mostly on cleanup data quality issues. Unfortunately data related budgets for many companies tend to go into platforms, frameworks which can only be used after you have quality data. Who makes the Outsourcing Decision? 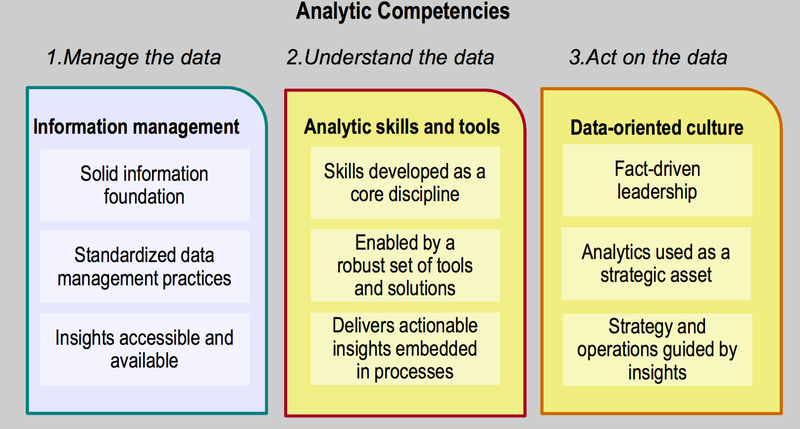 Who handles the management and implementation of analytics in the enterprise? CIO, CFO, CDO, LoB or marketing executives? 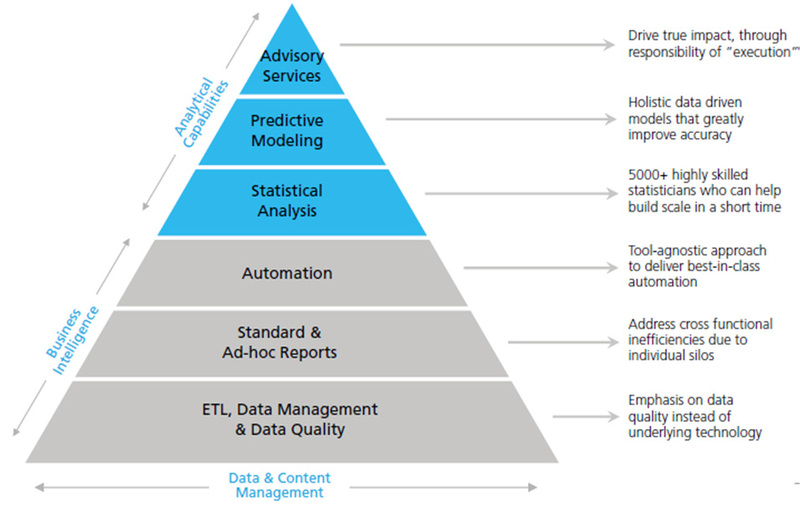 Most enterprises are struggling with the right operating model for analytics and data science. This was relatively straightforward with BI and data management which was often under a global CIO or CTO’s umbrella. Data sciences and analytics while seen as potential game changer seems to have a fragmented set of buyers: Line of Business, Function or even IT? Who is on point to fund the project? Depends on whether its a departmental initiative or a cross-silo initiative. In a recent Deloitte study, “The Analytics Advantage,” highlights how diverse the initiative ownership is. 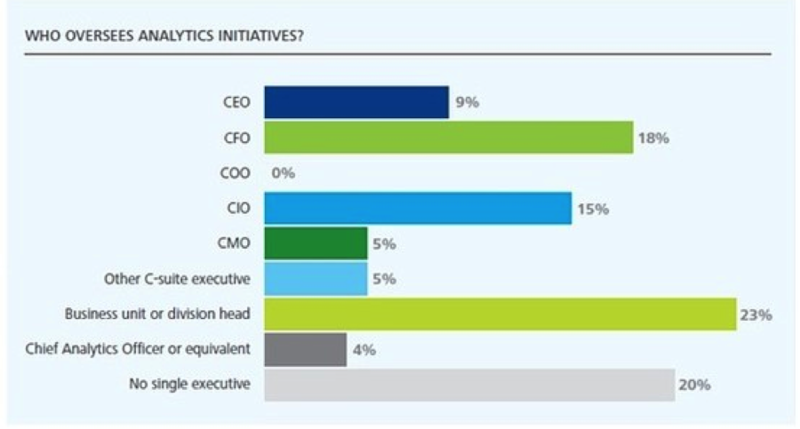 Executives in many different types of roles own the analytics initiatives within their enterprises, and no clear title emerges as the dominant owner (see below). What are the Range of Outsourcing Services Offered? Increasingly vendors are able to offer horizontal and vertical solutions effectively packaged in a variety of configurations. Vendors are becoming more sophisticated as they gain experience handling large, complex datasets. 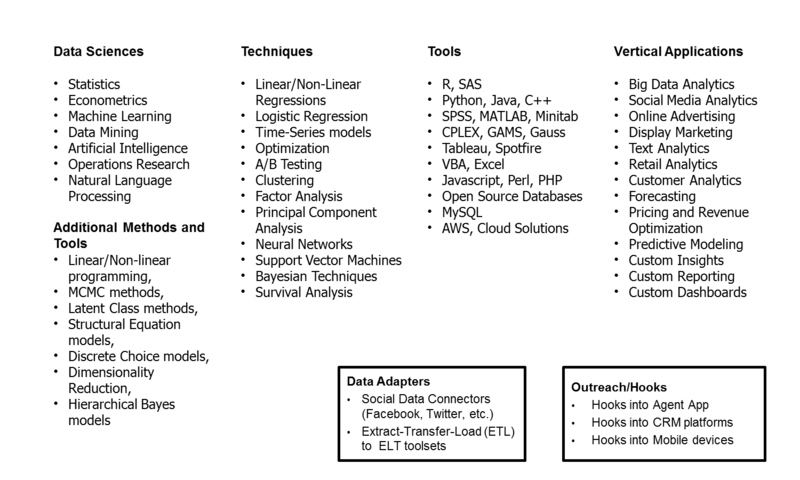 The services range from Data Sciences -> expertise in various techniques -> toolsets -> vertical specific expertise. What are the range of Technical Skills? There has been explosion of innovation in the Hadoop Ecosystem. Companies are racing to adopt new open source tools to gain a competitive advantage. Does your vendor have a deep enough bench in these projects? Do they have architecture skills to be put together effective solutions around target use-cases? Technical toolkits around Big Data and Analytics include: RDBMS, Open source Hadoop distribution (e.g., Apache Hadoop), Commercial Hadoop distribution (Cloudera, Microsoft, MapR, IBM, …), Cloud-based Big Data platform (AWS, Rackspace, …), Cassandra, MongoDB, Hbase, Hive, Kafka, Pig, Search (ElasticSearch, Solr, Lucene, …), Spark, Storm, and Zookeeper. What is Data science? Data Science is an umbrella term that encapsulates the extraction of timely, actionable information from diverse data sources. It covers data collection, data modeling and analysis, and problem solving and decision making. It incorporates and builds on techniques and theories from many fields, including mathematics, statistics, pattern recognition and learning, advanced computing, visualization, and uncertainty modeling with the goal of extracting meaning from data and creating data products. Idiro Technologies (Predictive modelling specialising in Social Network Analysis, Big Data) – www.idiro.com. Issues to Consider in Picking an Analytics Service Provider? Ability to Analyze and interpret results: Moving to more complex predictive models requires domain expertise and use case knowhow….most vendors claim to have this but very rarely do. How easy are they to work with? Do you have to spoon feed them or ambiguity is ok. Since clients are looking for faster turn-arounds for more sophisticated insights on continuously increasing amounts of data, vendors need to deliver solutions that will scale better with lower cost of ownership to meet their clients’ internal service-level agreements. Emerging Technology Expertise… can they help innovate around new data sources like Mobile or hyper-connected “Internet of Customers”. What are Different Resource Cost models? Onshore consultants (Data scientists will be in the $250-350 per hour range); Specialized domains (Risk Analytics) will carry a 30% premium ($300-$600 per hour fees). Also hot geographic areas with lot of startups like San Francisco or New York…the rates will be much higher…. supply vs. demand. China, especially Shanghai, is a good place for analytical talent in my experience. India also with different Indian Statistical Institutes (where sound engineering firm Bose came from) also has good cheap talent. We built an actuarial center of excellence in New Delhi which worked well. Offshore consultants (India will be around the $30-$75 per hour range — good for dashboard creation and other commodity work… many people i spoke to are not sure about about offshore talent for generating complex analytical models and insights). Resource costs depend on domain expertise and analytics niche: Predictive analytics (Industry specific); Behavioral analytics; Risk analytics; Sales & Marketing analytics, Social media analytics, Web analytics. What are the different Pricing Models in Analytics Outsourcing? Cost Plus. This approach pays the supplier for its actual costs, plus a predetermined profit percentage. This plan allow little or no flexibility when business objectives and technology change during the life of the contract, nor does it give any incentive for the supplier to perform more effectively. Risk/reward sharing. Here, the buyer and supplier each have an amount of money at risk and each stand to gain a percentage of the profits if the supplier’s performance is optimum and achieves the buyer’s objectives. What are the Measures of success ? How effective are vendors in scaling (upwards – more and downwards – less)? Depends on whether the vendor is an IT vendor like TCS, Big 5 like Deloitte or pure-play analytics vendor like Mu-Sigma. These vendors can rampup from a standing start to 200 people in a few months. Vendors can also rampup around technology platforms like SAP, Oracle more easily than around use-cases like marketing analytics. For more challenging use cases like recommendation engines, next best offer which require more sophisticated modeling (simulation, optimization, time series etc.) – most vendors probably can assemble a small team but not be able to scale easily beyond 10. Domain modeling expertise, Architects and skilled project managers tend to be the hardest skills to find. What are the Expected Benefits of Analytics Outsourcing? Specialization, Focus, Speed-to-market and Scale – tend to be the expected benefits. Firms must not expect to outsource analytics and then just assume that the specifics will take care of themselves is a recipe for disaster. Managers must retain enough program management capability to enforce processes, communicate with all parties, and keep track of critical details. The communications industry is characterized by intense competition and customer attrition, or “churn.” Targeted marketing opportunities and the rapid response to behavior trends are paramount to the success of communications service providers in retaining existing customers and attracting new customers. Customer relationship management, or CRM, analyses need to be constantly and quickly performed, to enable service providers to market to at-risk customers before they churn, offer new products and services to those most likely to buy, and identify and manage key customer relationships. Other key analytical needs of communications service providers include call data record analysis for revenue assurance, billing and least-cost routing, fraud detection and network management. For online businesses, the process of collecting, analyzing and reporting data about page visits, otherwise known as click stream analysis, is required for constant monitoring of website performance and customer pattern changes. 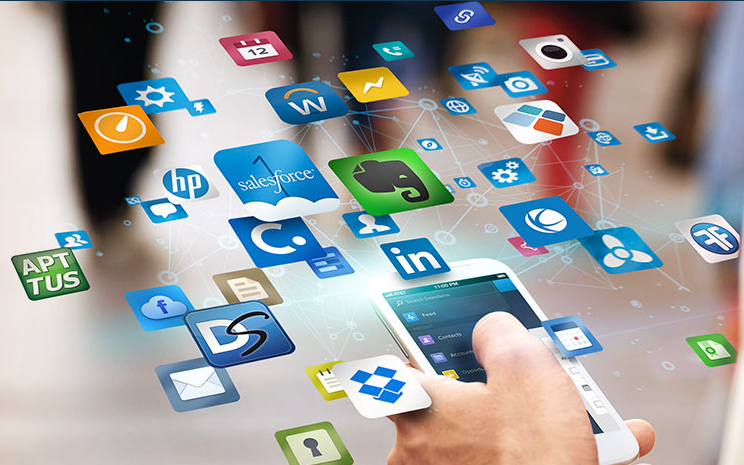 In addition to needing to address the operational and customer relationship challenges faced by traditional retailers, digital media businesses must also analyze hundreds of millions or even billions of click stream data records to track and respond to customer behavior patterns in real time. Additionally, with online advertising becoming a major revenue generator, many digital media businesses and their advertisers need to understand who is looking at the advertisements and their actions as a result of viewing the advertisements. Fast analysis of online activity can enable better cross-selling of products, prevent customers from abandoning shopping carts or leaving the web site, and mitigate click stream fraud. With thousands of products and millions of customers, many retailers need sophisticated systems to track, manage and optimize customer and supplier relationships. Targeted marketing programs often require the analysis of millions of customer transactions. To prevent supply shortages large retailers must integrate and analyze customer transaction data, vendor delivery schedules and radio frequency identification supply chain data. Other useful analyses for retail companies include “market basket” analysis of the items customers buy in a given shopping session, customer loyalty programs for frequent buyers, overstock/understock and supply chain optimization. See this blog posting for KPIs for Retail Industry. Financial services institutions generate terabytes of data related to millions of client purchases, banking transactions and contacts with marketing, sales and customer service across multiple channels. This data contains crucial business information on client preferences and buying behavior, and can reveal insights that enable stronger customer relationship management and increase the lifetime value of the customer. In addition, risk management and portfolio management applications require analysis of vast amounts of rapidly changing data for fraud prevention and loan analysis. With extensive compliance and regulatory requirements, financial institutions are required to retain an ever-increasing amount of data and need to make this data available for detailed reporting on a periodic basis. See this blog posting for KPIs for Financial Services Industry. As some of the largest creators and consumers of data, government agencies around the world need to access, analyze and share vast amounts ofup-to-date data quickly and efficiently. These agencies face a broad range of challenges, including identifying terrorist threats and reducing fraud, waste and abuse. Iterative analysis on many terabytes of data with high performance is crucial for achieving these missions. Healthcare providers seek to analyze terabytes of operational and patient care data to measure drug effectiveness and interactions, improve quality of care and streamline operations through more cost-effective services. Pharmaceutical companies rely on data analysis to speed new drug development and increase marketing effectiveness. In the future, these companies plan to incorporate large amounts of genomic data into their analyses in order to tailor drugs for more personalized medicine. See this blog post for Digital Health and Data. The significant growth of enterprise data is fueling a need for additional storage and other information technology infrastructure to maintain and manage it. These technology needs are being further driven by a steady decline in data storage prices, which makes storing large data sets more economical. As the volume of data continues to grow, enterprises have recognized the value in analyzing such data to significantly improve their operations and competitive position. They have also realized that frequent analysis of data at a more detailed level is more meaningful than periodic analysis of sampled data. In addition, companies are making analytic capabilities more widely available to a broad range of users across the enterprise for both strategic and tactical decision-making. These factors have driven the demand for next generation data warehouses infrastructure like Hadoop, NoSQL, Spark that provide the critical framework for data-driven enterprise decision-making by way of business intelligence. The shortage of analysts is driving companies to consider outsourcing their segments of this value chain.. “Raw Data -> Aggregated Data -> Intelligence -> Insights -> Decisions -> Operational Impact -> Financial Outcomes -> Value creation.”. Clearly, choosing the right analytics providers (onshore or offshore) and structuring effective business relationships that deliver continuous value require managers to have a clear understanding of what they’re looking for and the potential risks involved. 3) Shared Services is an alternate service delivery model that enables organizations to apply economic principles of demand and supply to internal business processes. Shared services help consolidate efforts for delivering the same services to different groups within an organization. 5. A. Fisher, “Wanted: Data Scientists. No Math Chops? No Problem,” Fortune, May 10, 2013, http://management.fortune.cnn.com. There are 3 billion people connected to the Internet. And it is not just about people. Think about 200 billion devices from sensors to machines all connected to the Internet. And think about the pace. Every 60 seconds, there will be 1 million Facebook updates, 265,000 snapchats, 2.5 million Google searches and 204 million emails sent. Great list and article! You may want to add Marketale.com which is into data science driven digital data analytics specializing in Clickstream analytics solutions with a tag all approach for data collection.